Considerable resources have been committed to providing information and communication technology in Australian schools. However, little is known about their effects on professional practice and student learning. 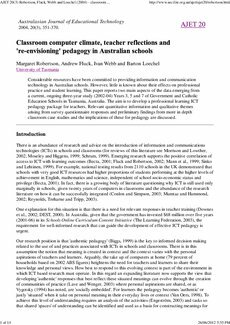 This paper reports two main aspects of the data emerging from a current, ongoing three-year study (2002-04) Years 3, 5 and 7 of Government and Catholic Education Schools in Tasmania, Australia. The aim is to develop a professional learning ICT pedagogy package for teachers. Relevant quantitative information and qualitative themes arising from survey questionnaire responses and preliminary findings from more in depth classroom case studies and the implications of these for pedagogy are discussed.